I have read a few books where the character has died and finds herself/himself in a sort of purgatory or in Heaven. While I did enjoy reading most of those books, I felt that something was lacking. 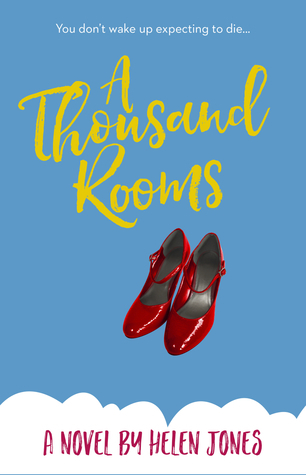 So when I saw that A Thousand Rooms was available to read on NetGalley (which means I didn’t have to request it), I jumped on it. Mainly because I was curious about how A Thousand Rooms would be and I needed a break from the usual genre’s that I have read. I thought the plotline was a very original one. Instead of being sent to Purgatory, people who have just died either are met by someone as soon as they pass or they are shown how to find their own personal Heaven. Again, I thought that was a very original idea. I loved the idea that people could create a Heaven that suits them. I also like that there were, for lack of a better term, Heavens were truly selfless people go. The whole chapter with Valhalla and the Valkyries made my heart hurt. I didn’t like Kate at first, going, to be honest here. I thought she was very immature. I mean, she was truly upset that her favorite pair of shoes kept going down in price for the first few chapters and she was upset when her mother, sister, and bestie arrived to clean out her apartment. But there was a gradual change, which started when she hitched a ride with a couple that was reunited after death and kept on going until the end of the book. There is a slight Christian undertone throughout the book but it wasn’t preachy. If anything, the author explored different religions and concepts about life after death and what happens. The turning point in the book was when Katie stumbled upon a Hindu (I believe, it wasn’t stated outright) funeral and befriended the girl who just died. What that girl’s Guardian said to her set the pace for the rest of the book. I love that soul mates, reincarnation and past lives were all brought out in the book and in explained in such a way that I couldn’t help but think “Well, what if….“. Jason’s explanation of why he wasn’t in Katie’s life this time around was sad but he said that he watched over her for her entire life. When she finally got together with Jason, she started remembering her past lives with him. Jason also explained that they are all reincarnated but it is up to the Guardians as to when, where and who they will be reincarnated as. If I had a complaint about this book it would be that I wish more information was given about the Guardians. Jason’s explanation to Katie, that they were angel-like beings, was good but I wanted to know more. It was with a Guardian’s help that Katie was able to make peace with her life and move onto her own Heaven. I thought the end of the book was very sweet and it made my heart happy to read what happened. Why: This is a book that will make you ugly cry throughout it. It has great characters, a great plotline and was overall a good read. A lovely review of A Thousand Rooms – thanks, Jolie! It was very interesting. I like that idea too. Also love the idea that you can reconnect with your soulmate too.